More than 40 contestants as well as Miss Florida board members gathered at the Hilton Garden Inn in Lakeland on Saturday, April 7, to package food for kidsPACK. 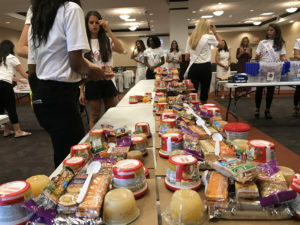 The Miss Florida Class of 2018 packed food for thousands of Polk County children who would have otherwise gone hungry, all part of the annual Miss America Serves Day. On Saturday, April 7, 42 contestants as well as Miss Florida board members gathered at the Hilton Garden Inn in Lakeland. Working as a team, contestants packaged the food they had brought from their communities, creating to-go meal packs that will later stuff hundreds of backpacks for pre-screened children at R. Bruce Wagner Elementary to eat over the weekend, when the children wouldn’t have access to school meals. The event was organized by kidsPACK, a nonprofit organization in Lakeland, and served as yet another example of how the Miss Florida Pageant is a year-round part of the Polk County community. Before the packing began, kidsPACK Executive Director Patty Strickland implored the gathered Miss Florida hopefuls to find serve others, especially the less fortunate. kidsPACK is a nonprofit organization supported by community leaders, faith based organizations, sponsors and volunteers dedicated to feeding homeless and hungry children by giving them a backpack of nutritious food each Friday to sustain them on weekends when they don’t have access to school meals. Started before the 2011-2012 school year, they fed 449 homeless or hungry children in 31 Polk County public schools. Today, the project is in three counties – Polk, Hillsborough and Hardee – where they have fed more than 1700 children in 73 different schools. The Miss Florida Organization is part of the larger Miss America organization. Miss Florida 2017, Sara Zeng, was crowned on July 1 in the Youkey Theater in Lakeland, the second year the pageant was held in Lakeland. Former Miss Florida’s include actress Delta Burke, 1974; actress Nancy Stafford, 1976; and television sports journalist Laura Rutledge, 2012.